iOS 7 introduced typographically heavy and complex designs that pushed solutions using string drawing and WebKit (both based on Core Graphics) to the limit. Going down to Core Text (an Advanced Unicode layout engine) may be overkill to simply render a label. Apple’s answer was Text Kit which is a fast, modern, object-oriented text layout and rendering engine which is built on Core Text and is tightly integrated with UIKit. In fact, all of Apple’s UI text-based controls like UILabel, UITextField, UITextView, and even UIWebView were rebuilt on top of Text Kit. This should provide seamless animations in UITableViews and even UICollectionViews. This week I had the opportunity to get into Text Kit. 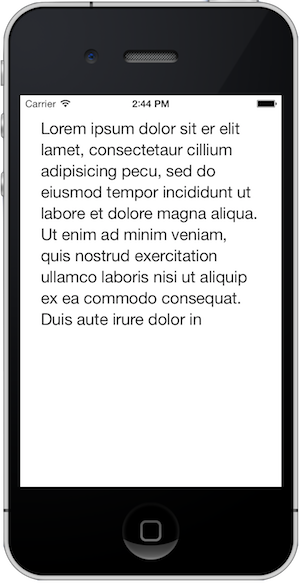 The app I am working on has some views which are text heavy and to some have a small, hard to read, text. The answer was Text Kit’s Dynamic Type that provides designed type styles that are not only optimized for legibility but also user selectable through the Accessibility Settings on the iPhone. Getting this to work was easy and I started by building a prototype so as to know what I needed to add to the app. I’ll describe step-by-step what I did to build the prototype and although I have the prototype posted on GitHub I recommend you follow along step-by-step. 1. 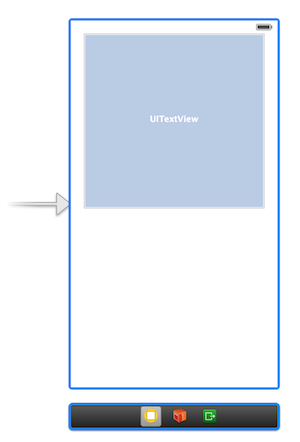 I first created a iPhone Single View Application and in my Main.storyboard dragged a UITextView onto the View Controller. The system content size is exposed to users in Settings > General > Text Size as a slider with seven different base sizes where the default size roughly matches the font sizes previously recommended for iOS 6 and below. Changing the Text Size now triggers the NSLog. Next we need to actually respond to the notification of Content Size Changes by changing the text in the UITextView. This sets the text view font to one based on the new preferred size. Run the app again and the font size will change in the View Controller. To sum it up the implementation of Dynamic Type only requires a UIFont method call and one NSNotification. 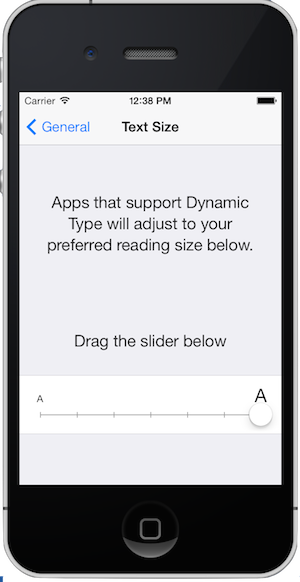 Apple has made this low hanging fruit and we really have little excuse to skip Dynamic Type support. This entry was posted in Uncategorized and tagged Dynamic Type, Text Kit. Bookmark the permalink.